Now that we’ve discussed how to locate the basic transform controls for your layer, it’s time to set keyframes for animating our basic values. So, what is a keyframe? Well a keyframe is just that, a frame in the movie that is a key piece to understanding what you want your movie to do. Without a keyframe, you would have no animation–keyframes are essential in allowing After Effects to know at which point you want to change a value, and at which key point you want to change the value back–or even change it to a completely new value altogether. To begin exploring keyframes, select your DEMO layer, and hit the “S” key to pull up your scale control. Next, change the value in the first number from 100% to 40%, and hit the return key. You should now see that your red DEMO layer got much smaller–60% smaller, to be exact. By placing a 40% in the value, you are telling AE to show this layer at 40% its original size or a reduced size of 60%. With your layer at 40%, you can set your first keyframe. Remember, this keyframe holds the information about every value you adjust per transform control. Make sure you are at (0;00;00;00 or frame 1). Back to your keyframe insertion, make sure your DEMO layer is selected and that you have pulled up the scale “S” transform control. Next to Scale should be a stopwatch icon. By clicking on the stopwatch you will see a diamond appear to the right in the track view and over to the left next to your transform control. The diamond is your keyframe. Note: FPS stands for “Frames Per Second”–standard film animation and television falls at 29.97fps. This indicates that you have 30 frames in one second of animation or film. Higher frame rates, such as 60 or 120FPS, allow for higher definition for detailed effects like slow motion since there are 60 -120 frames in one second of animation. Since you have locked in your values at the beginning of your composition, you can now scroll out your timeline or Current Time Indicator (CTI) and drag it to 1 second or (0;00;01;00). From here you have two easy ways to create another keyframe. Just make sure to pay attention–if you click the stopwatch again, all your keyframes will vanish. The first way is to start editing the value of your scale control again. For example, if you begin to scroll the scale percentage up to 100% again, a keyframe will automatically appear in your timeline. The second way to do this it to first set a keyframe by clicking the small diamond to the far left, in between the small triangles. This will make a keyframe; however, it will still need some more information. As long as your CTI is still at this point, anything you change within the transform control for scale will be remembered inside this keyframe. 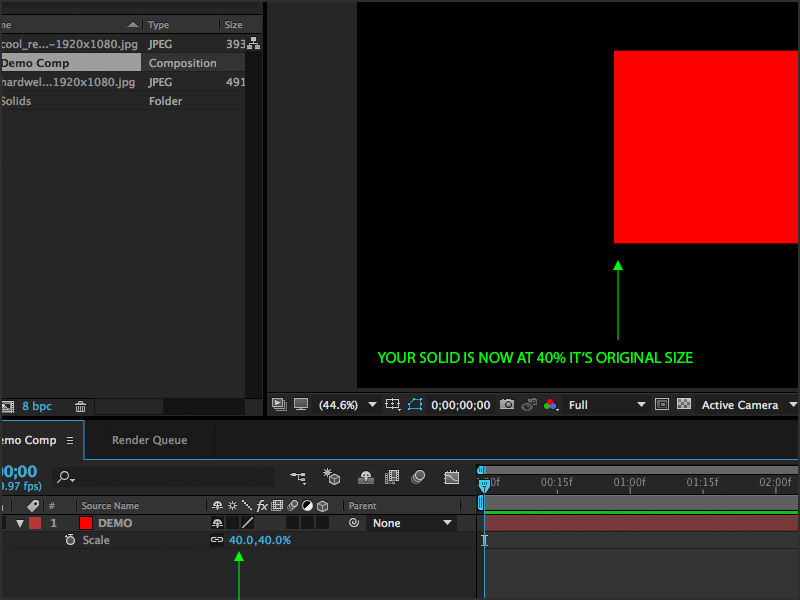 There are great features built into After Effects and one particularly helpful one is the Easy Ease Keyframe. When you select it, the animation will become smoother when it finishes its upward scale. The concept behind easing the animation is so the movement becomes more natural. The basic parameters you need to know are that your keyframes are not moved or altered, but the values between your first and next keyframe become slower or closer in value as they move toward the last keyframe. Without the Easy Ease, your animation will scale up and stop too quickly, making it seem less natural and more robotic. 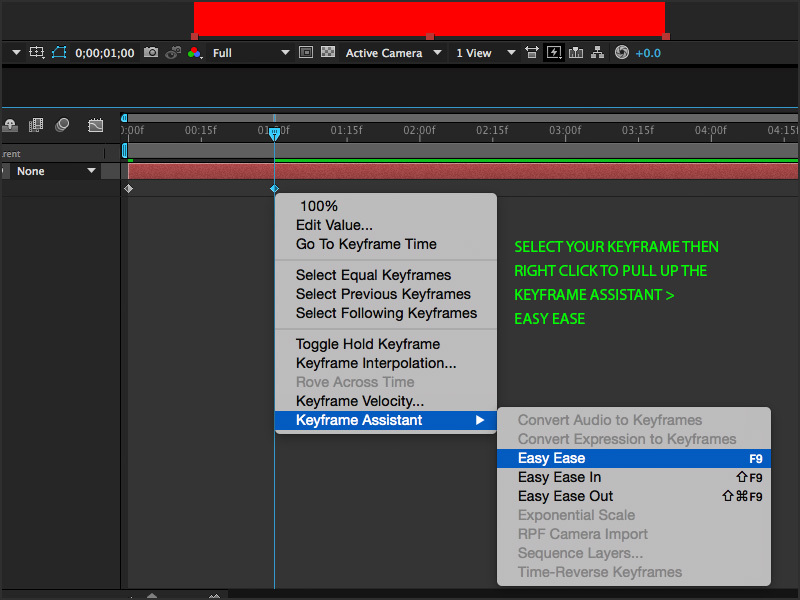 To use Easy Ease, you can either select the last keyframe and hit the shortcuts, or you can right click > Go To Keyframe Assistant > Easy Ease. You can also choose between Easy Ease In or Easy Ease Out. In will respond to the animation moving into the selected keyframe, whereas Out will respond to the animation moving out from the selected keyframe. Note that your keyframe will change from a diamond to an hourglass shape, this way you know which keyframes are affected by your specialized keyframe assistants. Now, let’s move on to parenting, null objects, and motion Blurs.